Time to sell your Baywatch condo? Read about today's resort-market buyer. 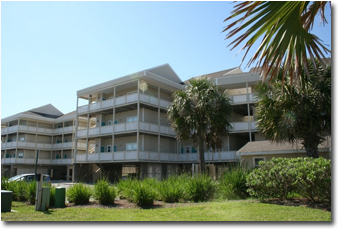 With five low-rise buildings sprawled out right on the beach of the Santa Rosa Sound, Pensacola Beach’s Baywatch condominiums are just right for families looking to stay in the area. Just across the street from Baywatch you will find the crystal-white sands of the Gulf of Mexico and the Santa Rosa Sound just outside your door. The five four-story buildings that make up Baywatch hold 87 units that each have two bedrooms and two bathrooms. Enjoy beautiful views of the Gulf or Santa Rosa Sound from your private balcony. The community outdoor swimming pool and sundeck are perfect for an afternoon spent outdoors and close to home. If fishing is more your speed, there is a private fishing dock that runs from the center of the community out into the Santa Rosa Sound. There are a number of charter fishing boats nearby that are also perfect for a day or weekend spent fishing in the Gulf of Mexico. Although the neighborhood Baywatch sits in is relatively quiet, they are still within walking distance of an amazing seafood restaurant and a short drive away from many other exciting things in Pensacola Beach. Peg Leg Pete’s is a short eight minute walk away, serving up fresh seafood, oysters, steak, and salads that are sure to please the whole family. A nine-minute drive brings you to Pensacola Beach Boardwalk. Enjoy some delicious Caribbean-inspired fare while you look out over the Sound at Hemingway’s Island Grill or grab some drinks at Bamboo Willie’s Beachside Bar before taking a walk along the coast. For date night, the upscale Grand Marlin is just nine minutes away. Create some unique memories with your family when you book a scuba diving tour at the Bay Breeze Dive Center just fifteen minutes away. Key Sailing, located on the Pensacola Beach Boardwalk offers everything from sailboat rentals to dolphin tours. Head on down and arrange for the whole family to go parasailing or rent some jet skis to zip around the Sound together! Please let us know if you would like further information for Baywatch or any other condos, homes, or real estate along the Gulf Coast or would like to schedule a private viewing by emailing info@condoinvestment.com.